Panasonic DP-UB9000 review | What Hi-Fi? The convenience of streaming and on-demand content might have diminished the lure of physical formats, but we’re glad 4K Blu-ray players like the Panasonic DP-UB9000 still exist. Panasonic has pulled out all the stops for its latest machine, slapped on a £849 price tag and it delivers on all levels. The build quality of the DP-UB9000 can best be described as bomb-proof. It feels as if no expense has been spared on the design, whether it’s the chunky aluminium body or the components found inside. The DP-UB9000 makes Panasonic’s previous flagship player, the DMP-UB900 (£600), and even our reference Cambridge Audio CXUHD (£700), look and feel a little budget in comparison. It uses a rigid two-layer chassis which helps promote low noise and low vibration. The disc drive is mounted centrally, and uses a thick steel plate to further reduce vibration and noise during play. Where the UB900 had one power supply which fed both its digital and audio sections, the UB9000’s audio circuit gets its own dedicated power supply to help maximise sound quality. There’s even a special circuit board for the player’s analogue output. At the heart of the Panasonic DP-UB9000 is its second-generation HCX (Hollywood Cinema Experience) picture processing engine. Part of this package is the new HDR Optimiser, which Panasonic claims to be able to improve tone-mapping in an HDR picture with static metadata. It takes into account the brightness limitations of your display and tweaks the image to extract the most detail particularly in whites and bright scenes. If you are watching content that already contains dynamic metadata, such as a movie encoded in Dolby Vision, the player recognises this and bypasses the HDR Optimiser. The DP-UB9000 comes equipped with a pair of HDMI outputs, so you can send the audio to your home cinema amplifier while the picture goes directly to your display. The presence of a 7.1 multi-channel analogue output will satisfy owners of legacy AV receivers, while you can take your pick from either balanced XLR or unbalanced RCA connections for stereo playback. In addition to all that video processing prowess, the UB9000 also ticks the boxes of all the main audio formats, including WAV, FLAC, AIFF, and AAC. It uses a high-grade 32-bit/768kHz DAC to help with all the data conversion. Streaming apps such as Amazon Prime Video, BBC iPlayer and Netflix come pre-installed. This is handy if you’re connecting the UB9000 to a projector, but if your TV has them built in, keep the video chain as short as possible and use those instead. The remote control is styled in the usual Panasonic fashion, with chunky, responsive buttons and a backlight for operating in a darkened room. 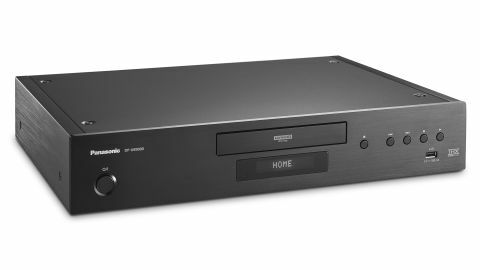 Due to the limitations of the chipset used in the DP-UB9000, there’s no room for either DVD-Audio or SACD support, so Panasonic’s flagship 4K deck doesn’t double as a universal disc player. As with any high-end video source, it pays to spend a bit of time getting acquainted with menus and settings. You should set the target luminance for the player, which helps the HDR Optimiser do its job better. There are six settings to choose from, with options based on the brightness output of your display device. We wish the menus were easier to understand, though. Quite a few on the Panasonic are over-complicated and just confuse matters. Why would you want to turn the player’s Dolby Vision or HDR10+ support on or off when there’s an option for the machine to switch automatically? It all feels a bit unnecessary. We feed the DP-UB9000 a selection of 4K Blu-rays, starting with the remake of Jumanji, and the picture we get on our LG OLED TV completely blows us away. As our four intrepid explorers are dropped off at the start of their hunt for the Jaguar’s Eye, the jungle backdrop looks breathtaking. Clouds, blue skies and lush foliage combine to create a picture rich with information and beautifully shaded colours. The level of detail on display is stunning. From the definition on The Rock’s tattoos and bulging biceps to the frayed badges on Kevin Hart’s gilet, the potent combination of detail and clarity keeps you fixed to the screen. As the group attempts to outrun a marauding biker gang by weaving in and out of cover, the player handles the motion and shift from shadow to light with skill and finesse. And, when they reach a ridge above a waterfall, the overhead camera pan is almost enough to start a bout of vertigo. We switch to the 4K Blu-ray of Baby Driver and the Panasonic DP-UB9000 produces a similarly inviting picture. During the opening chapter, as the getaway car arrives on the scene, the Subaru’s glossy red paintwork and black alloy wheels look exquisite. The motion from every handbrake turn and powerslide is handled with confidence. You get the impression it will take a lot to rattle this 4K Blu-ray player. Flick the HDR Optimiser on and off and the player subtly firms up the brightest elements of the picture, particularly the flaring around headlights as the crew leave the car park after their first bank job. The UB9000 also excels when handed the job of upscaling a 1080p Blu-ray. The Times Square battle between Spidey and Max in The Amazing Spider-Man 2 is a great test scene, with plenty of dark details to investigate and punchy neon colours to communicate. The reds, blues and finer details and textures of Spider-Man’s suit are impressively rendered. Max’s neon blue CGI persona punches powerfully against the city sky with little in the way of on-screen noise. It’s these upscaling skills that set the Panasonic apart from rivals such as the Cambridge CXUHD. The picture is just clearer, sharper and more insightful across the board. We’d have no qualms paying the extra money demanded by the DP-UB9000. Panasonic has set the bar pretty high when it comes to picture quality, and that’s mirrored by a similarly robust sonic performance. Dialogue between Max and Spidey is crystal clear, the electrified rasp to Max’s voice giving his lines a menacing feel. There’s also subtlety and extra attention to detail, from the orchestral score darting around in the background to the crackle of electricity as it courses through Max’s body. The tension and danger in the scene feels immediate and then it explodes into life. As Max feeds off the power to the city and sends billboards tumbling to the ground, you feel the full force of each crash and smash. There’s no hardness as glass shatters and showers down over the assembled crowd. Switch to U2’s U2360° at the Rose Bowl Blu-ray and the Panasonic’s qualities of clarity, space and detail are all there in abundance. The bassline to With Or Without You sits at the front of the track as the Edge’s riff floats hauntingly in open space. Drums sound subtle yet each strike sounds explicit with it. It’s all topped off by the fine detail in Bono’s voice – there’s no vagueness here. The Cambridge CXUHD times better and delivers the rhythm of the track more accurately, but loses ground on the Panasonic when it comes to resolution, power and solidity of sound. This is a focused, high-performance machine – and a home cinema powerhouse. If you own a surround system that can make the most of the Panasonic DP-UB9000’s many talents, you won’t be disappointed. We haven’t come across many Blu-ray players that allow the 4K disc format to look and sound this spectacular.